My iPad kept telling me that I was not authorized to view content when I tried to watch 2 rented movies. I connected my iPad to iTunes and needed to completely restore it for some reason. Now, I’ve lost the 2 movies I rented and have yet to watch. How do I re-download the movies. I’ve gone to my account and they don’t appear anywhere. –Asked by bigalwood on Apple Support Communities. I rented a movie on iTunes and it won’t download and when I check my downloads it’s not there. then when I click to rent it again it just says that it’s already been rented and can’t download. –Asked by norbergk on Apple Support Communities. Rentals are a one-time only download, they won’t show for redownloading – try contacting iTunes Support and see if they will grant you a redownload. As we all know, renting movies from the iTunes Store is much cheaper than purchase one. So many iTunes users prefer to rent one through the iTunes store on computer or iOS device. If you want to rent a movie, just browse it on the iTunes Store and look for it with a Rent button. When you click Rent, your movie downloads. Download time will vary according to the file’s size and your Internet connection speed.Your rental will be charged to the credit card associated with your Apple ID. You can also use iTunes Store credit to rent movies. After rented the movie, you can watch it on your Mac / PC, an iPhone / iPad / iPod touch (with iOS 3.1.3 or later), An iPod classic or iPod nano (3rd, 4th, or 5th generation) and Apple TV. If you rented the movie on your PC and want to watch it on your iOS device, just connect the devices and sync via USB. If you move the rented movie from your PC, it will disappera from your computer’s iTunes library. You can move the rented movies from one iOS device to another one, but you can only have the rented movie on one iOS device at a time. It should be noted at that if you rented the movie on your iOS device or Apple TV, you can’t move it to any other device. To watch an HD movie, you need to play it on a supported device: your computer, iPhone 4 or later, iPad, iPod touch (4th generation or later), or TV using Apple TV. You have 30 days to start watching a movie after you rent it. Once start playing the rented movie, you only have 24 hours (in the US) or 48 hours (elsewhere) to finish it. You can watch the movie as often as you like until it expires. If you don’t start watching a movie within 30 days, you must rent it again. Movies you rent disappear from your iTunes library when the rental period ends. How inconvenient it is! There are many iTunes movie rental converter available for you. 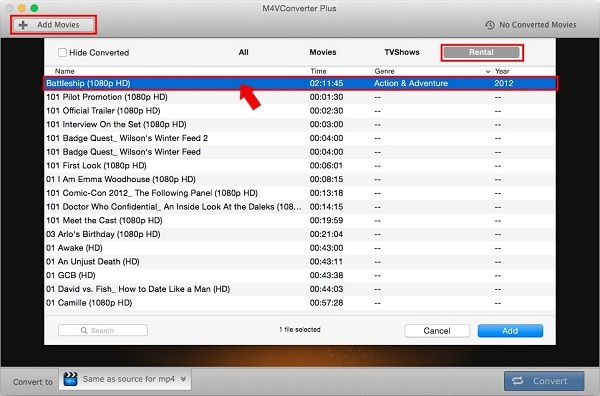 Here you can try M4V Converter Plus (for Mac & for Win). It is the best solution for you to remove DRM from iTunes movie rentals and convert M4V to various video formats. Step 1: Free download M4V Converter Plus, install and launch it(Here we use Mac version, you can find windows tutorial here). Step 2: Add iTunes movie rentals to the converter. Click “Add Movies” in the main interface. Add the iTunes movies you rented from the iTunes Store. You can import all your rented movies to the program, because this M4V Converting tool could do batch conversion for you. Step 3: Click “Convert to” profile to choose the output format. From the profile drop-down list, you can find M4V Converter Plus supports various formats such as MP4, MOV, AVI, WMV, MP3, etc. Here you can choose one as you like. Step 4: Finally, click the button “Convert” to start converting iTunes movie rentals. After all settings done, just click Convert button to begin the iTunes movie rentals conversion progress. And this program will do the rest for you. And minutes later, you will find the converted iTunes rented movies on Converted Movies folder. And now you can move the videos anywhere and watch them any time.